The Masters of the Universe Classics line continues with the next wave of Super7’s Masters of the Universe Collector’s Choice and Club Grayskull figures! The new assortment of 8 heroes and villains are sculpted once again by the fantastic Four Horsemen. · The pre-order window for Wave 2 of Masters of the Universe Collector’s Choice and Club Grayskull opens on Monday, October 2nd at 12:00 Noon PST at Super7Store.com. The pre-order will be open for the month of October, ending at midnight PST, October 31st. (Spooky Halloween ending time! 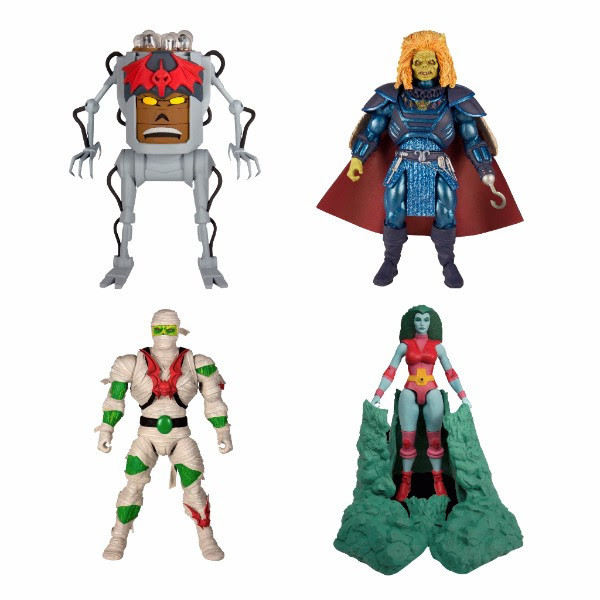 · This pre-order is only for full sets of the Wave 2 MOTU Collector’s Choice (4 figures: Dylamug, Granita, Karg, and Wraptrap) and Wave 2 Club Grayskull (4 figures: Man-E-Faces, Mer-Man, Sorceress, and Tung Lashor) assortments. · Once you place an order for a full set of Wave 2 Collector’s Choice or Club Grayskull, you can add as many single additional figures from their respective set to your order without having to buy an additional full set. Orders for individual figures only without a full set ordered will be cancelled. Each 4-figure set will be $139.99 and any additional figures will be $34.99 each. · This is a made-to-order release with production based on the pre-orders received. The projected shipping date for these figures is May 2018. Please understand that this date is subject to change once production and shipping from our factory is in progress. That 5 percent fee for the payment plan option they added in the fine print is a classy touch.